The DSCC had already cancelled weeks of planned advertisements, save those planned for the final two weeks before the November election. Senate Majority PAC, a Super PAC associated with Senate Minority Leader Harry Reid (D., Nev.), has similarly cancelled weeks of planned advertisements in Ohio intended to help Strickland in the key battleground race. The ad cancellations, first reported by Politico, will largely be viewed as a sign of Democrats’ acknowledgement that Portman is likely to beat Strickland, a former congressman and one-time governor, and keep his seat in the U.S. Senate. Portman has expanded a lead over his competitor over the last few months, as he has won a flurry of endorsements from labor unions with a history of backing Strickland. Portman’s campaign also has considerable more cash on hand than that of his Democratic challenger. The DSCC disclosed the cancellations following the release of a Quinnipiac University poll showing Portman with a 17-point lead over Strickland. On Friday, Strickland fell under scrutiny after footage obtained by the Need to Know Network showed the Democratic candidate telling an audience that Ohio taxpayers had been "raped" by the charter school system in the state. 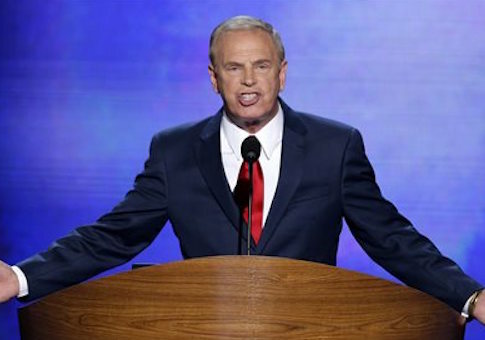 This entry was posted in Politics and tagged 2016 Election, Ohio, Rob Portman, Ted Strickland. Bookmark the permalink.